Author Talbot writes that ". . . there is evidence to suggest that our world and everything in it. . . are also only ghostly images, projections from a level of reality so beyond our own it is literally beyond both space and time." Hence, the title of his book. Beginning with the work of physicist David Bohm and neurophysiologist Karl Pribram, both of whom independently arrived at holographic theories or models of the universe, Talbot explains in clear terms the theory and physics of holography and its application, both in science and in explanation of the paranormal and psychic. His theory of reality accommodates this latest thinking in physics as well as many unresolved mind-body questions. This well-written and fascinating study is recommended for science collections. "A wake-up call to wonder, an adventure in ideas." -- Larry Dossey, M.D., author of Space, Time & Medicine --This text refers to an out of print or unavailable edition of this title. Nearly everyone is familiar with holograms—three-dimensional images projected into space with the aid of a laser. Two of the world's most eminent thinkers believe that the universe itself may be a giant hologram, quite literally a kind of image or construct created, at least in part, by the human mind. University of London physicist David Bohm, a protégé of Einstein and one of the world's most respected quantum physicists, and Stanford neurophysiologist Karl Pribram, an architect of our modern understanding of the brain, have developed a remarkable new way of looking at the universe. Their theory explains not only many of the unsolved puzzles of physics but also such mysterious occurrences as telepathy, out-of-body and near-death experiences, "lucid" dreams, and even religious and mystical experiences such as feelings of cosmic unity and miraculous healings. 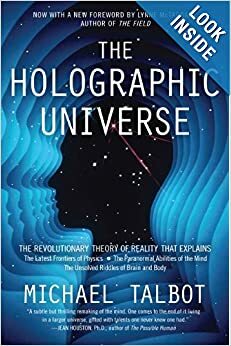 Now featuring a foreword by Lynne McTaggart, Michael Talbot's The Holographic Universe is a landmark work whose exciting conclusions continue to be proven true by today's most advanced physics, cosmology, and string theory. Michael Talbot was born in Grand Rapids, Michigan in 1953. He was the author of 'Mysticism and the New Physics', 'Beyond the Quantum' and 'Your Past Lives: A Reincarnation Handbook', as well as three novels. He died in 1992. --This text refers to an out of print or unavailable edition of this title.